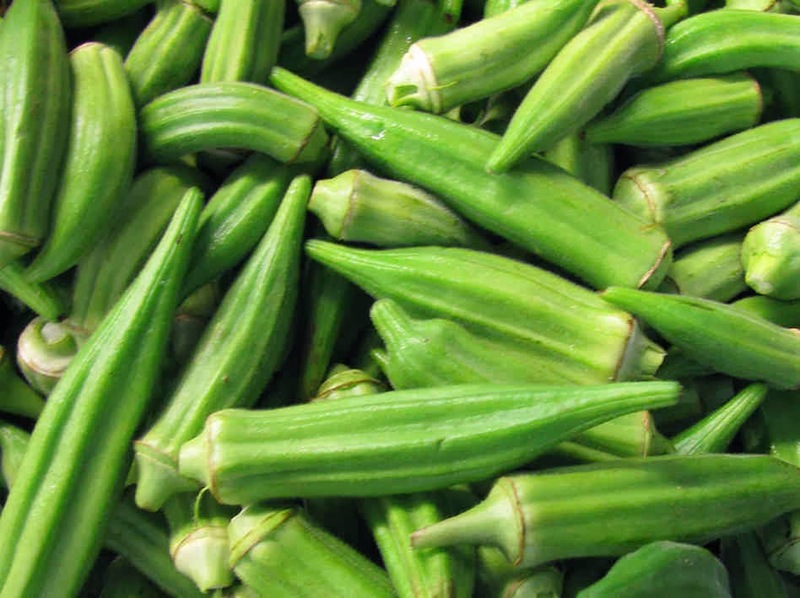 Niloufer's Kitchen: Okra: A pod worth picking on. Okra: A pod worth picking on. Originating from Africa, the word Okra called okwuru may have sprouted from one of the Nigerian dialects in the Igbo Language. The French call it Gumbo. The Indian sub-continent Bhindi, bheeda. The Arabic world, Afghanistan, Iran and the Middle East all refer to it as Bamia/Bamya/ Bamieh. The Egyptians refer to it as a stew with lamb similar to our Parsi Bhida ma gos! It is also popular in the Far Eastern world of Malaysia, Singapore and Thailand in particular. Mostly eaten cooked, it can be consumed raw. Keeping it crisp has the maximum nutritional values. Crispy fried in tempura batter it can be delicious. Try the same in a pakora batter. Stuffed Okras are a delicacy served at weddings in certain cultures! I can just imagine those noses being turned up at this understated, happily avoided vegetable! If cooked right they can be delicious. Worth a shot, trust me. People have always been clever enough to know which vegetable helped prevent and cure certain ailments. Our wise ancestors seemed to have shared their knowledge and stayed healthy with the help of natures bounty. In modern days we are fortunate enough to find out the detailed analysis of everything. The DNA of a piece of vegetable is quite incredible. Broken down into Minerals, Vitamins and Antioxidants, it can tell us exactly how it can help us maintain good health. What we take for granted and shrug away lightly on a daily basis, can essentially be our road to preventive medicine. This could work to our advantage as we learn more about this amazing pod. This green long pod of goodness grows on a small green stem. 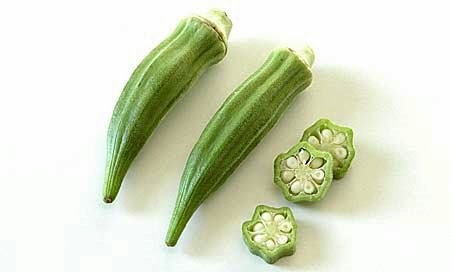 The Okra itself can be short and stubby, long and fat or thin. slim and crisp. Variations depend on the geography and the soil where it grows, when it is harvested and lots of other factors. Part of the mallow family, it is related to the cotton crop, hibiscus and hollyhock plants. It is mostly a tropical plant grown in the heat of the summer. 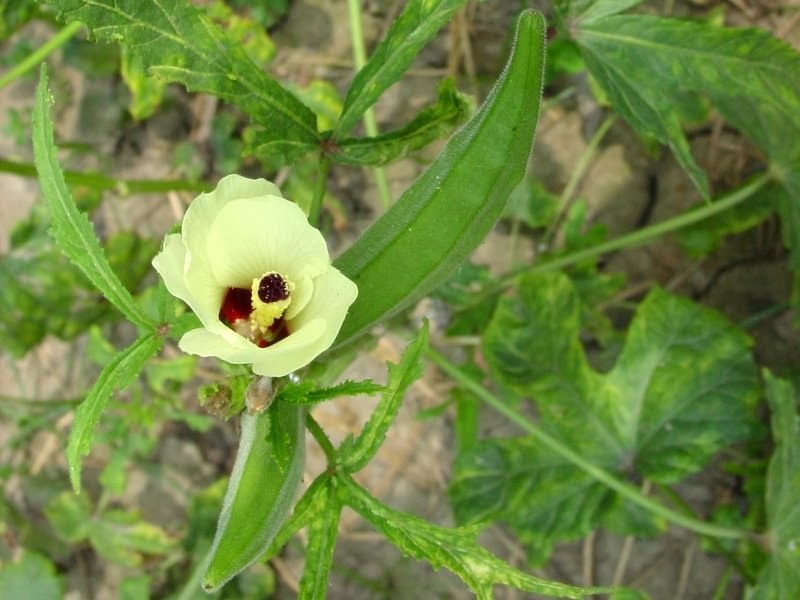 The beautiful flower that blossoms on the Okra vegetable stem. It can be rather prickly with the thorns! Naturally high in alkaline it helps to balance the acidity in our body. It is also considered to be a good natural gut cleanser; a probiotic. It contains the good flora which is known to prevent all sorts of stomach related problems; constipation and digestive problems. Colorectal problems and those associated with the Colon may be kept at bay. It helps in healing ulcers and acid reflux. Additional health benefits are a glowing skin. It can prevent pimples from popping up! It is brilliant for nurturing the scalp. Including dandruff protection, it can help rejuvenate dry listless hair in need of new life. People living in India, UK and Canada, regularly drink a glass of water soaked overnight with fresh Okra to help diabetics maintain their blood sugars. Full of minerals and vitamins it helps build strong bones, prevents osteoporosis and looks after the joints in general. The Folic Acid present in Okra can help women keep healthy during their pregnancy. 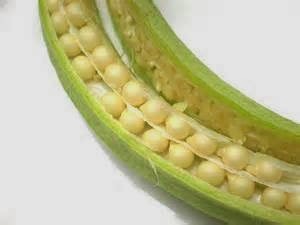 The plant is made of the outer green pod, the little white pearly beads inside and the "top" that is the root of the pod. It is slightly furry on touch, can be hard and fibrous as it becomes older and yet sweet and crisp when picked early on. It is best eaten when young and tender. It contains a mucilaginous juice which gives it the slimy texture; a result only once touched by a knife! It is generally this slimy feeling that turns people away from eating this vegetable. There are a number of ways to reduce and avoid that. Niloufer's Kitchen; Learn the art of eating! !